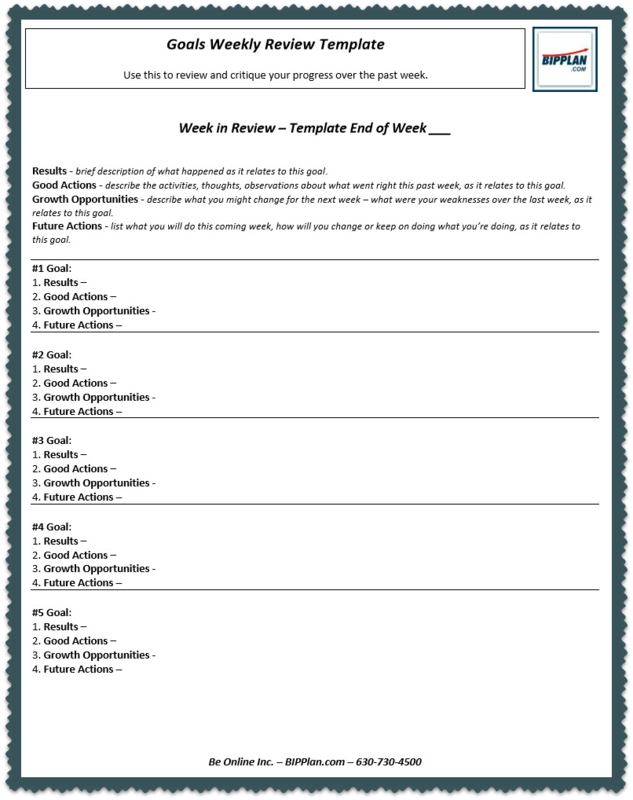 Use the template below to get started with your business goals. Click on the form to print off the form, click here to print a PDF of the form or e-mail me for the form in Microsoft Word format for editing on your own. A very important part of setting a goal is to ensure it is a SMART goal (Specific, measurable, attainable, realistic, Time-Based). Making your goals ‘SMART goals‘ makes accomplishing your goals easier – it’s definitely your choice! Two pitfalls to be aware of: not making sure the goal(s) were measurable and making goals that depend on others for the outcome. This template is designed for small, targeted goals. Setting and accomplishing goals is a habit. 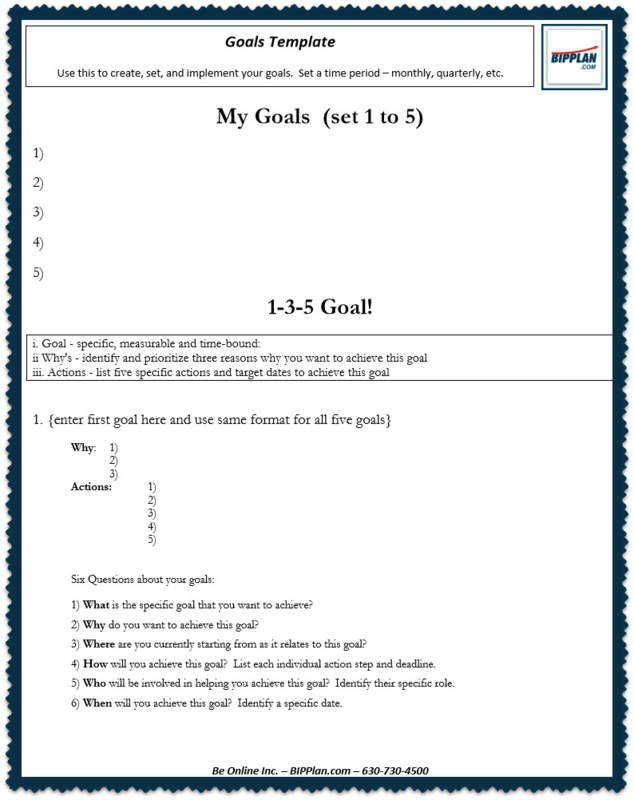 This form is intended to help you identify realistic goals. Reviewing and redirecting are the second most important activities in setting and achieving goals. Set one day a week to sit down and review your goals. It is best to set a timer and promise to only spend a few minutes on each goal reviewing each goal. Please try to remove emotions, judging yourself or thinking of what you “should” have done. The very POINT to this exercise is to help you move forward! Just fill in the information for each goal and move on to the next one. Click on the form to print off the form, click here to print a PDF of the form or e-mail me for the form in Microsoft Word format for editing on your own. Consider the following excerpt from the Introduction in a wonderful book written by Brian Tracy called Eat That Frog. Mark Twain once said that if the first thing you do each morning is to eat a live frog, you can go through the day with the satisfaction of knowing that that is probably the worst thing that is going to happen to you all day long. Your “frog” is your biggest, most important task, the one you are most likely to procrastinate on if you don’t do something about it. It is also the one task that can have the greatest positive impact on your life and results at the moment. This is another way of saying that if you have two important tasks before you, start with the biggest, hardest, and most important task first. Discipline yourself to begin immediately and then persist until the task is complete before you go on to something else. Think of this as a test. Treat it like a personal challenge. Resist the temptation to start with the easier task. Continually remind yourself that one of the most important decisions you make each day is what you will do immediately and what you will do later if you do it at all. Yes, I consent to receiving tips and small business tools from this website. We deliver online marketing and other automation tips to make your small business run more efficiently.